The balloon was launched at 9:20am from Redditch, Worcestershire. Due to strong westerly winds aloft, the balloon travelled 106 miles east to a small village near Newmarket, Suffolk where it was recovered at 1:17pm. The 800-gram high altitude balloon was filled with 3.5 cubic metres of helium, enough to carry a parachute and a payload containing a waterproof high definition camera, a SPOT GPS tracker and of course Ned the astronaut. The balloon and payload ascended into the sky at a rate of 6.5m/s. As the balloon rose the outside air pressure decreased causing it to expand until the balloon reached bursting point. It took 67.3 minutes for the balloon to reach a burst altitude of 26,400m where it was possible to see the curvature of the earth and the refection of the sun on the Thames Estuary. The payload then descended back to earth at an average rate of 14m/s. The balloon was tracked in real time using the SPOT GPS tracker; this meant the drive to find the payload could begin before the balloon had landed. The payload was safely recovered in a farmer’s field, having crashed into a fence. An element of luck was present as it is not uncommon for weather balloons to land in hard to reach places such as trees or rivers. The preparation of such a launch involves the purchasing or hiring of equipment: a camera, balloon, helium, GPS tracker, parachute, and payload box. In many high altitude balloon launches the camera will freeze or run out of battery during flight. To prevent this from happening, the camera was wired to a larger external battery pack that sat inside the payload box and heat packs were used to keep all equipment warm. It is essential to gaining permission from the Civil Aviation Authority (CAA) by filling out an online form 28 days before launch. This is of great importance as flight traffic control need to be aware of the launch to ensure the balloon does not obstruct any flight paths. Future plans for further launches include improvements such as using multiple cameras, a larger balloon for increased burst altitude and an onboard flight computer to collect temperature and altitude data. This entry was posted in research, students on 6th Mar, 2015 by sj294. Participants from across Europe met to discuss the challenges of gaining public consent for grid infrastructure during the workshop hosted by the University of Exeter and CEDREN in London last week. Several countries have major plans to upgrade their grids, for a range of reasons including connecting new, climate neutral energy production as well as needs related to maintain and increase security of supply. However, in many countries, plans for new high voltage power lines have often been met with strong opposition and there is general agreement that grid companies as well as responsible authorities need to address the challenges related to public engagement and participation to better reconcile these conflicts. This week nearly 50 interested people from several European countries met to discuss challenges of improved public involvement in high voltage grid planning processes. Representatives from grid companies and transmission system (TSO) operators in Norway and the UK, as well as energy authorities, NGOs, researchers and other stakeholders from across Europe attended the workshop, which was hosted by the project SusGrid and the University of Exeter. The workshop presented key findings from the SusGrid project, a four year interdisciplinary project with primary funding from the Norwegian Research Council. The project has included international research cooperation, primarily between the Norwegian research center CEDREN, and two UK universities; University of Exeter and University of Durham. The project started in the aftermaths of highly controversial projects such as Beauly-Denny in the UK and the Hardanger (Sima-Samnanger) project in Norway. The workshop offered opportunities for grid companies and authorities to share their experiences and their recent efforts to enhance dialogue and participation as well as providing input from stakeholder groups both concerning climate and landscape conservation challenges. Obviously, the challenges raised in the workshop are often similar across countries and regions. Delegates at the workshop. Image by Pete Hodges, University of Exeter. The SusGrid project provides significant knowledge input to develop more sustainable grid regimes and to foster understanding of public acceptance of new power lines. Findings suggest that the key factors promoting acceptance of power lines include trust in the TSO, fair and meaningful planning procedures that involve local residents, mitigation of visual and other environmental impacts and the adoption of a sustainability approach to environmental benefits. Read more about results from the Susgrid project. This entry was posted in business, research on 1st Dec, 2014 by sj294. Professor Andrew Thompson, Director of the Centre for Imperial and Global History at the University of Exeter, discusses the effects culture has on the economy. Culture, as described by one celebrated critic, is among the most awkward words in the English language. So it comes as no surprise that cultural value is an ever-elusive, indefinable thing. The broad and diffuse nature of the concept has meant that many economists steer clear of it, reluctant to co-opt culture into their debates about development. And so discerning the influence that culture has on the economy is something of a holy grail in the ongoing quest to establish cultural value. The case for spending public money on culture is greatly weakened by this failure to fully get to grips with its relationship to the economy. At a time when the Institute for Fiscal Studies’ warns that up to 60 per cent of public sector spending cuts are yet to be implemented, the arts and cultural sector more than ever needs to make its case to government – and it needs to do so in a manner comparable to claims made by other competing calls on the public purse. Several enquiries, including that of the Warwick Commission, are currently seeking to open up new ways of thinking about cultural value. They are very welcome, even if they are not the first and will doubtless not be the last to do so. Those making a case for the benefits of culture invariably do so in two ways. First, culture is said to have intrinsic value. 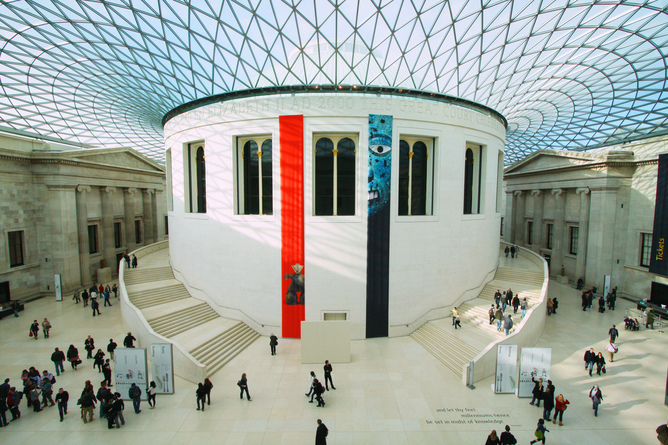 Museums, galleries, theatre and libraries, by enriching and illuminating our inner lives, have a humanising effect. For this reason they should be cherished (and invested in). Second, the tangible or instrumental value of culture is also stressed, for example in terms of jobs generated by tourists visiting heritage attractions, or the money people spend when they visit museum exhibitions, or the recession-proof growth achieved by the creative industries. But both of these methods have a major limitation. The idea of intrinsic value separates culture from the economy and assumes culture’s status as a public good, while the instrumental renders culture as a sector of the economy, alongside other sectors with which it has to compete. Neither leaves much scope for exploring culture’s importance for the economic life of the country as a whole. So to push back on the idea that the arts and culture are a luxury rather than a necessity requires us to develop a very different type of dialogue about the relationship between culture and the economy. The time is ripe to do so. As Western hegemony is increasingly regarded as a chapter in world history, and China is poised to overtake America as the world’s leading economic power, a new narrative about culture’s relationship to the economy becomes possible, in a way it was arguably not 20 or 30 years ago. We might start by observing that economically successful societies are invariably culturally confident ones. It’s a frequent refrain among today’s politicians, of whatever stripe, that creativity is driving the world’s higher performing and more technologically advanced economies. Creative societies can expect to generate greater growth, higher levels of productivity and more inward investment. Even economists – who fight shy of messy concepts like culture – acknowledge that economic factors alone are insufficient to explain why some countries get themselves on to a development trajectory and others do not. Following in Max Weber’s footsteps, the braver among them try to capture the macro-economic effects of culture. Such efforts to reclaim culture by economists are welcome but hardly mainstream. The vagaries of human behaviour are such that they do not easily generate testable hypotheses or provide fodder for econometric models. Our intuitions may tell us that culture and the economy are strongly intertwined, but demonstrating this in an analytically convincing way (and generating the “proof” that might influence governmental policy) is another thing. One way forward may be to look at what we can learn from a few of the negative scenarios: cases where culture has actively hindered growth. And we don’t have to look very hard in a world where conflict is all around us. By far the biggest challenge for many societies as they enter the 21st century is precisely how they make cultural difference and diversity work in favour of economic growth. The World Bank has tellingly observed that “no low-income or conflict-affected state has yet achieved a single Millennium Development Goal” (2011). Because conflict inflicts such deep wounds on the fabric of society it is also hugely debilitating economically. Political solutions rarely address what happens after conflict ends. This opens the door to cultural interventions. 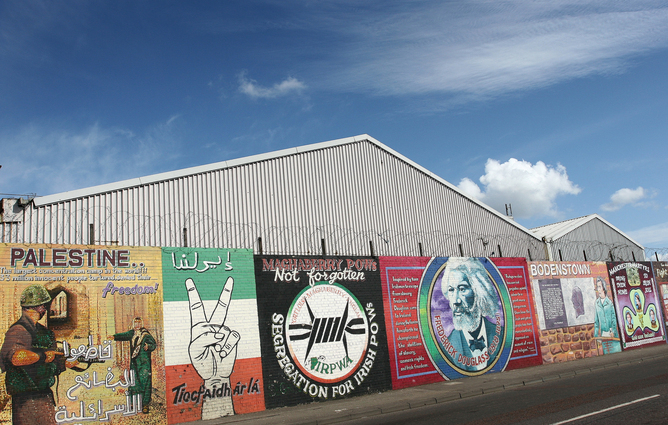 In South Africa, Argentina, Bosnia and Northern Ireland, to name but a few, growing prominence is being given to the contribution made by artistic practises to processes of peace building and reconciliation. Societies trying to work through difficult and divisive pasts are turning to the restorative power of drama, music, film and literature to break down walls of silence about atrocities, to allow victims to share their stories of suffering, and to rekindle the ability to imagine again. The therapeutic value of the arts in releasing powerful emotions previously repressed is increasingly apparent. The upside economically is important too – one recent assessment of the global costs of violence estimates that GDP in 2007 would have been 14 per cent higher if there has been no conflict since 1960, equivalent to $9.1trillion. Meanwhile the world’s current violence containment expenditure is equivalent to a staggering 75 times its foreign aid expenditure. It is in “post-conflict” societies that we see very clearly how, for better and for worse, culture is as much part of the economy as the economy is a part of culture. Yet the study of conflict calls for a much more nuanced understanding of culture – an understanding that encompasses culture as practice and performance (drama, literature, music, photography, for example) and culture as patterns of thinking, feeling and acting by groups of people who live in the same social environment. When the West was economically ascendant a very particular set of cultural traits (trust, work ethic, risk taking and entrepreneurship) were widely held to have been responsible for its success. But with the BRICs making up a quarter of the global economy, things look rather different today. The idea that Western societies are culturally programmed to be more competitive simply seems far fetched. The relationship between the culture and the economy is clearly more complex than that. “Political economy” is our shorthand for the interplay between the political and the economic. Why not a “cultural economy”? In every society the economic is embedded in culture. In economic terms this means that culture counts, even if it can’t always be counted. Yet a general field of cultural economy has yet to to be scoped out. We need to better understand how attractive cultural environments lay the foundations for economic prosperity. We need to establish more firmly the link between cultural diversity and economic creativity. We need to open our minds to the freedom to engage in cultural activity as a necessary counterpart to the economic (and political) freedoms which we rightly prize. In a globalised economy we also need to be alert to how the arts and culture can provide a way of thinking about ourselves as a country and the challenges of adapting to a rapidly changing world. In short, we need to devise better ways of bridging the divide between culture and the economy. Only then will we be in a position to understand those many dimensions of culture that affect economic success. This entry was posted in research on 14th Oct, 2014 by sj294. Can we improve the wellbeing of people with dementia without the use of drugs? Dementia is a growing global health priority, with 7.7 million new cases identified each year. As research efforts begin to improve our understanding of this irreversible syndrome, there is growing consensus that patient wellbeing can be improved without the use of drugs. Interventions that focus on the use of therapeutic spaces are gaining momentum but what evidence exists to support their use? A team at the University of Exeter Medical School, supported by the National Institute for Health Research Collaboration for Applied Health Research and Care South West Peninsula (NIHR PenCLAHRC), has been conducting research into the various aspects of dementia care. Here Rebecca Whear, a specialist in health services research, describes their recent work and how it sits in the context of the growing dementia care debate. Associated with an ongoing decline of the brain and its abilities, symptoms of dementia include memory loss and a reduction in thinking speed, language use and understanding. In 2012 David Cameron pledged to increase funding for research into dementia health and care as part of the UK’s National Dementia Strategy and since then there has been a steady flow of research findings and recommendations. The majority of people living with dementia in the UK are supported by their close families, friends or more formal carers in their own home. However, a third live in residential care homes and at this stage are likely to be displaying more severe and challenging symptoms of the disease. Almost half of the elderly people living in residential care have dementia or dementia symptoms, a figure which increases to more than three-quarters in nursing homes. Antipsychotic medications are commonly used to manage the behavioural and psychological symptoms of dementia, but some research has suggested a clear link between this treatment and increased risk of illness and death. Consequently there is now important and increasing interest in exploring opportunities to help people to feel better without the use of (or by reducing) medication. Such opportunities might include changes in the environment and design of the residential care setting, engagement in other activities such as spending time in a garden, and improved training for care home staff. Such changes may be able to help calm and relax residents with dementia and may also benefit other residents and the staff around them. 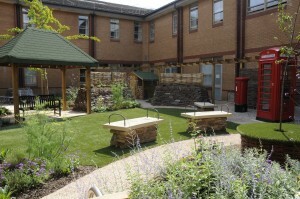 The new Devon Garden for patients with dementia, which is currently in development at the Royal Devon and Exeter NHS Foundation Trust. In some of our most recent research we analysed how spending time in a garden can affect the wellbeing of people with dementia in care homes. We also examined the perspectives of families and carers about the use of a garden as part of the care setting in order to identify information that would help in the design and use of care home gardens in the future. Our systematic review, which analyses all available evidence on this particular question, critically assesses 17 small studies from the US, UK, Australia, China, Canada, Sweden and Finland. Most of this research looked at the impact of gardens on the wellbeing of people with dementia, but three looked at the impact of horticulture therapy. The results suggest that use of a garden may lower levels of agitation in residents with dementia but that impacts on emotional wellbeing, sleep, changes to medication and risk of falls were less certain. 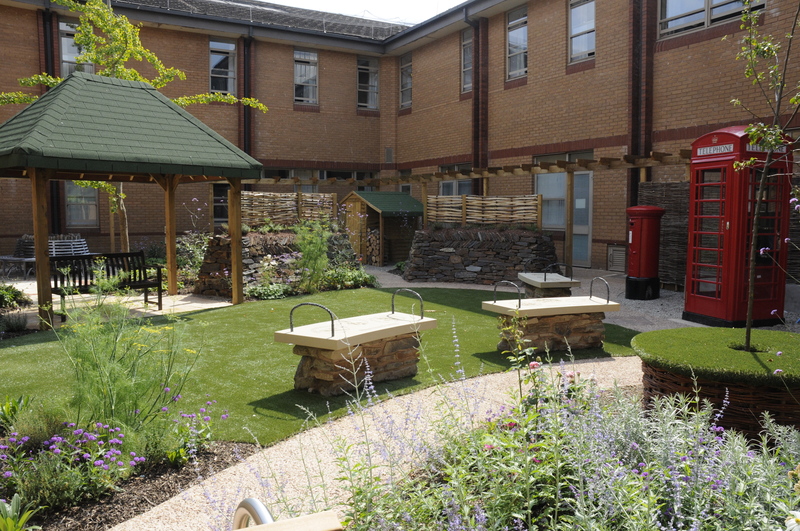 The views and experiences of the garden for residents, families and staff give us further insights into how the gardens are used and the impact they can have. Families said they valued somewhere pleasant to meet that stimulated interest and conversation with their loved ones, and care home staff reported the calming effects the gardens had on residents. Importantly, our research also highlighted some barriers to using gardens, such as the perception of the garden as a hazard and limited staff time for supervision, leading to gardens being effectively inaccessible for residents. Another area of our research looked at a range of measures that could improve the experience of mealtimes in residential care – in order to improve the nutrition and behaviour of residents with dementia. Looking at all the available research we found that a number of factors, such as playing music at mealtimes, could result in improved food intake among the elderly and better mealtime behaviour in those with dementia. We also found that introducing changes such as a wider choice of menu and more pleasant eating environment could reduce the risk of malnutrition and agitated behaviours. Similar pieces of research have also been conducted on a range of therapies to improve the psychological and behavioural symptoms of dementia including light therapy, music therapy, reminiscence therapy and validation therapy. All of which report inconclusive findings due to the low number and poor quality of research studies conducted so far. This is characteristic of studies in this area, small study sizes, use of a variety of tools to measure the same points of interest and poor reporting of studies make it difficult to draw together a common understanding of the evidence. Despite some positive findings, it is clear that the use of non-pharmacological interventions for people living with dementia are currently understudied and undervalued by policy makers. We really need more high quality evidence to establish clear results and ensure benefits for those living with dementia. This entry was posted in community, research on 1st Aug, 2014 by sj294. Any readers who follow our social media accounts about Harvey (@FWHarvey on Twitter, and here on Facebook) will probably be aware that Harvey’s lost novel has been adapted as a play titled Will Harvey’s War at the Everyman Theatre in Cheltenham as the launch event for the Gloucestershire Remembers WWI community outreach programme (the play runs from 30 July to 2 August 2014). Additionally, the novel has been published internationally by the History Press. You can view the full the video with accompanying article on ITV’s website. This play is one of the most exciting secondary effects of the studentship’s dedication to preserving and making accessible FW Harvey’s personal papers. It serves as an example of how universities can use collaboration-based outreach programmes to successfully engage with communities, extending the value of academic research beyond academia and into the larger world. The project has already preserved Harvey’s papers at the Gloucestershire Archives, making them available to any researcher – whether they are academic, amateur, or simply casually interested. Now, thanks to this play, an even larger audience in Gloucestershire will learn about Harvey who was an important figure locally and nationally during the war, one the community was and should still be proud to call a Gloucestershire Lad. The play has extended the reach of one document found in Harvey’s papers to hundreds, and its publication as a novel has the potential to extend its reach to exponentially more. Grant’s studentship was funded by the University of Exeter’s Research and Enterprise in Arts and Creative Technology (REACT) initiative. REACT, which is backed by the Arts and Humanities Research Council (AHRC) funds collaborations between creative economy companies and arts and humanities scholars at its partner universities. These collaborations will make innovative use of academic research and technological know-how to share academic knowledge with new audiences, generate economic value in the creative economy and move forward the scope of digital technology. This post first appeared on the FW Harvey blog. This entry was posted in community, events, news, research on 29th Jul, 2014 by sj294. 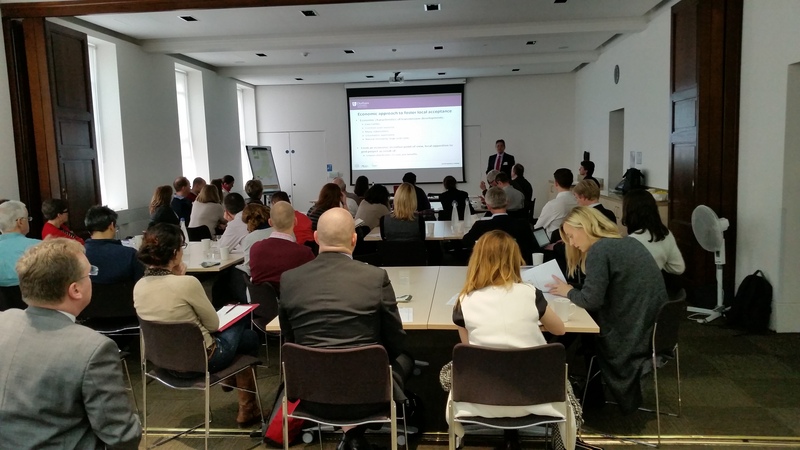 The Business Leaders Forum (BLF) is a regular event run by the University of Exeter. 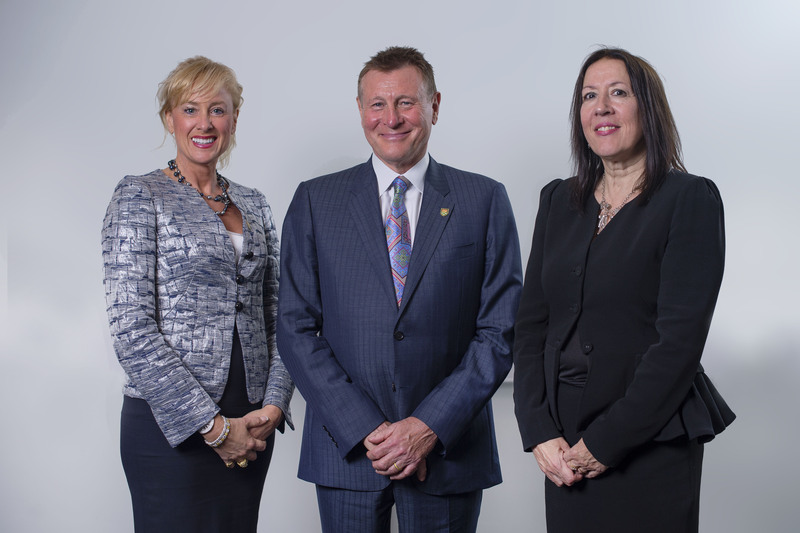 Aimed primarily at chief executives and senior management, it is a membership-based organisation that enables influential business people to stay up-to-date with current trends in business. Julie Whittaker, a Senior Lecturer in the Organisation of Markets at the University of Exeter Business School, gives her thoughts on the latest meeting, which had the topic of a circular economy. Experts have urged businesses to grasp new opportunities that can help to combat the twin challenges of rising resource prices and waste costs. The call came at the latest BLF, hosted by the University of Exeter, where it was highlighted that companies which fail to come to terms with these challenges are in danger of becoming less competitive. To take advantage of the new prospects, businesses need to position themselves as part of a circular economy, within which, in principle, all materials are cycled infinitely. 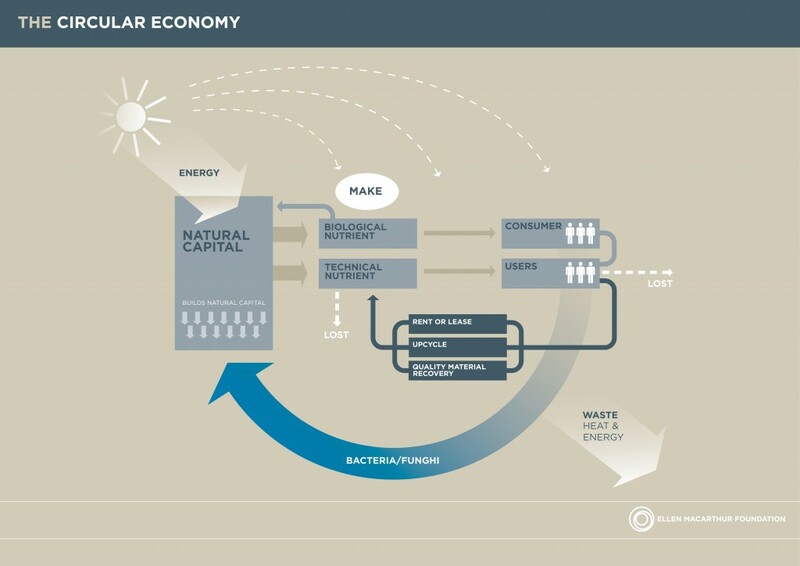 A diagram illustrating the circular economy. Courtesy of the Ellen MacArthur Foundation. James Walker, Head of Innovation for Net Positive at Kingfisher plc spoke about the steps his company, a large multinational retailer (which includes B&Q and Screw Fix) have started to take in moving the economy away from the take-make-waste linear pattern towards a more circular process in which goods are designed with either recycling, or even better, reuse in mind. James told attendees that electric drills are used on average for only 20 minutes in their whole life. He suggested that a better deal, both for the customer and the retailer would be to offer a box of tools for specific DIY tasks for hire rather than for sale. This would mean fewer tools manufactured and at the end of life the materials in the tools could be more readily recovered. We might question what this could mean for current tool manufacturers? As with most structural economic change, there are likely to be both gainers and losers. A circular economy is beneficial to the natural environmental, but James was keen to emphasise that while previously businesses have been motivated to reduce their environmental impact on ethical grounds, today it was a business necessity to adjust to the new market conditions. The second speaker, Devon based Mark Hodgson, a sustainability consultant with QSA Partners outlined the different types of circular economy business models, explaining how they can be adopted, giving South West examples. These models not only place a greater emphasis on providing services rather than products (eg providing access to tools rather than tool sales) but also give attention to design for reuse and recycling. Drawing on the example of Co-Cars (the Exeter car club he helped to establish) he illustrated how digital technology which provided easy access and monitoring of car use, enabled the circular economy business models to be commercialised. This entry was posted in business, events on 24th Jul, 2014 by sj294. The new £27.5million RILD building opened this week. The building will provide new space for world-class medical research and teaching. Katy Barwick, a PhD student in the University of Exeter Medical School, attended the opening. She works with the Neurogenetics and Community Genetics research group under the supervsision of Professor Andrew Crosby and Dr Lorna Harries. Here she gives her perspective on the launch event. An eclectic group of 180 guests, including delegates from the Wellcome Trust and Wolfson Foundation, Exeter council members, major partners and University representatives and many more attended the launch of the RILD centre on Monday 2 June 2014. Whilst VIPs received a private tour of the clinical research facility and laboratories during which they could witness the already well-functioning building in operation, guests were greeted with welcome drinks and canapés in the café and reception area. This was followed by inspiring and enthusiastic speeches by Professor Sir Steve Smith, Vice—Chancellor and Chief Executive of the University of Exeter, and Angela Pedder, Chief Executive of the Royal Devon and Exeter NHS Foundation Trust, both of whom expressed their pride over the success of the facility so far, and their confidence in the potential of this multidisciplinary, collaborative work place to tackle tomorrows healthcare problems by putting the quality of patient care at the centre of research. There was clearly a dream shared between those who have worked to create the RILD, and that is to provide an excellent facility which enables students, researchers, and NHS and University staff to come together to be trained and educated, apply knowledge in innovative ways, and work as one to improve treatment and quality of patient care. A dream which, as student who has been working at the RILD for the short time it has been operational, I can see has become a reality even in these early days. Despite the commitment, drive and vision of all those from the University of Exeter and the Royal Devon and Exeter NHS Foundation Trust that has been fundamental in the creation of the RILD, the development of the award winning £27.5million building would not have been possible without the generous part-funding that has come from The Wellcome Trust and The Wolfson Foundation. Thus, Dr Jeremy Farrar, the director of the Wellcome Trust, and Sir David Weatherall, a Wolfson Foundation trustee carried out the joint unveiling of The Wellcome/Wolfson philanthropy plaque. We were also honoured to have Dr Dennis Gillings, CBE, Hon DSc- the founder of the largest global provider of clinical trials and commercial marketing services to the pharma and biotechnology industry, Quintiles – as the keynote speaker and unveiler of RILD building plaque. 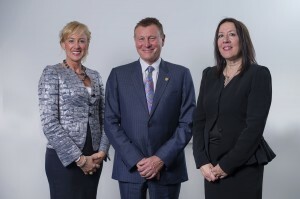 Dr M, Dr Dennis Gillings and Professor Janice Kay. Dr Gillings has been a pioneer in the world of drug development and clinical trials, and has received a number of honorary degrees from the University of Carolina, the University of London, the University of Southampton, and the University of Exeter. He was also honoured by the Queen as Commander of the Most Excellent Order of the British Empire for his services to the pharmaceutical industry, and more recently he was appointed by the Prime Minister World Dementia Envoy. Dr Gillings’ showed great optimism and belief in the future of the RILD, describing the facility as ‘epitomising the need for multidisciplinary interactive research’ and as a development that will ‘put both Exeter and the South West on the map, and expand the national contribution from this region’. He described the health care world as ‘evolving towards personalised, stratified, precision medicine and an explosion of health data’, and the launch of the RILD as a ‘milestone event for Exeter creating its opportunity to be a major player in this new healthcare world’. He stated that ‘Exeter is doing the right thing at the right time’, and that the investment made in the RILD is ‘expanding local infrastructure’, and ‘will help the NHS transform itself into 21st century medicine’. During the final part of the afternoon, guests were able to wonder around the building both to see the facilities, and to speak with staff about the clinical and laboratory research. As a researcher at the RILD, I found this to be a great opportunity to share our current research and show to the guests how much more the RILD is than a building, but a facility which provides an excellent working environment where communication between teams of the same and of different disciplines, and with patients, flows easily and effectively. Their interest and enthusiasm in our work was flattering and rewarding. In all, the RILD launch day was a successful event which generated an atmosphere of enthusiasm and excitement about the future of Exeter’s role in forwarding excellence in research and patient care. I believe the event was enjoyed by all, and that its’ success is an example of the future success of both the RILD and Exeter. This entry was posted in events, research, Uncategorized on 6th Jun, 2014 by sj294. The Transformational Climate Science conference, held at the University of Exeter on 15/16 May, provided an opportunity for key delegates from the Intergovernmental Panel on Climate Change (IPCC) community to summarise important findings from the recent Fifth Assessment Report (AR5). The conference consisted of individual panel discussions for each working group of the IPCC, with keynote speeches made by the co-chair of that respective group, plus a further three panel discussions on climate-policy. The first panel discussion focussed on the scientific developments made over the last five years. The co-chair of Working Group I , Thomas Stocker, lead discussions with a summary of various projections of future climate change. Key findings included that global surface temperature change by the end of the 21st century is now projected to exceed 2oC in all but the most mitigation-intensive scenario . Atmospheric carbon dioxide is currently at an unprecedented level compared with the last 800,000 years, and to achieve the regularly-touted objective of stability at 2oC warming future global emissions of carbon dioxide must total no more than 250 gigatonnes. Far from being proactive in the face of these projections, global emissions currently total 10 gigatonnes per year and were shown to be rising. Individual extreme climate events, such as the European heatwave observed in 2003, can only be explained by including anthropogenic factors in global climate model simulations, stated Peter Stott of the Met Office. Therefore, the need to integrate climate with society in order to protect our environment becomes all the more urgent, said Corinne Le Quere of the University of East Anglia, with the general theme of urgency prominent throughout the discussion. The second panel discussion, which focussed on the impacts of climate change and adaptation measures, again noted that certain observed climate changes are directly attributable to human influence. Despite the current implementation of adaptation measures, said the keynote speaker Chris Fields (co-chair of Working Group II), dealing effectively with climate change requires the introduction of ‘smart policies’ which must result from effective engagement between scientists and policy-makers. Frans Berkhout, of King’s College London, further added that there are significant limitations to all forms of adaptation, which should further prioritize mitigation efforts. Sori Kovats of the London School of Hygiene and Tropical Medicine, emphasised the regional disparities in risk of climate change, stating that exposure and vulnerability to climate extremes varies with location and noting that data on the socioeconomic impact of climate disasters is severely lacking. The regional effects of climate change, including effects to certain sectors within industry, noted the panel, need further quantification in order to aid policy-makers and to ensure that adaptation measures are suitable. The Thursday afternoon session included a discussion on the science and policy interface, aided by contributions from Andrea Tilche, representing the European Commission. The inclusivity of policy-makers within the IPCC framework was an important topic of debate, as was the effectiveness of dialogue between IPCC scientific representatives and governmental delegates. The evening session was open to the public, and comprised a panel discussion on the future of climate science. The topics of future impact on society and current state of emissions were ubiquitous throughout the proceedings. On Friday morning, a panel discussion was lead by representatives of Working Group III of AR5, focussing on the challenge of mitigating greenhouse gas emissions. Ottmar Edenhofer, the co-chair and keynote speaker, began by highlighting that global greenhouse gas emissions are continuing to increase, with the predominant driver being increases to income. Recent increases in fossil-fuel burning in Asia are comparable with the industrialization of the West, and effective mitigation efforts will require major technological and institutional changes to low-emission or zero-emission energy sources. The ethical and political dimensions of climate change were explored, including the accountability of nations for historical emissions and progress in developing sufficient political institutions to tackle climate change. The final panel discussion, chaired by Dame Julia Slingo, Chief Scientist at the Met Office, primarily focussed on future developments to IPCC and the climate science field in general. Pierre Friedlingstein of the University of Exeter suggested that the three working groups of the IPCC could potentially merge to synthesise proceedings and provide a single publication in the future. Other topics considered in the discussion included quantification of potential public health effects within projections which is currently lacking in the discussion, according to Sir Andy Haines of the London School of Hygiene and Tropical Medicine, and in general a movement to including the regional effects of climate change within projections. The panel discussed at length various developments to climate model specifications which could be implemented to ensure that uncertainty within climate change projections continues to be reduced. This entry was posted in events, research on 23rd May, 2014 by sj294. 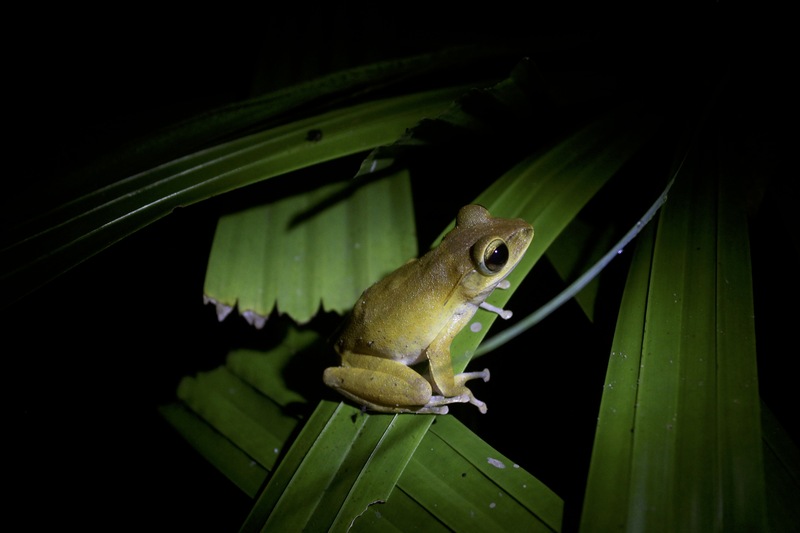 The University of Exeter’s Ben Toulson shares his thoughts on island biodiversity in recognition of today being the International Day for Biological Diversity and its 2014 islands theme. Ben is the director of student-led research expeditions at the Penryn Campus and spent the summer of 2013 studying the biodiversity and threats to the islands of Cambodia. Despite covering only three per cent of our global land area, islands are home to a disparate level of the world’s biodiversity. This is a result of the unique environments that islands create, volcanic islands in particular, with their great range in height, host a variety of habitats cut off from the rest of the world. 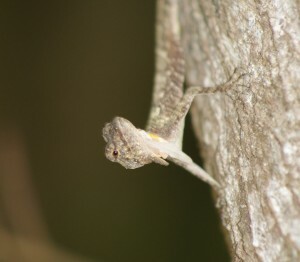 Wildlife caught on camera during a student expedition to Cambodian islands. The resulting isolation means that species on different islands may evolve different, despite being geographically separated by just a few miles. 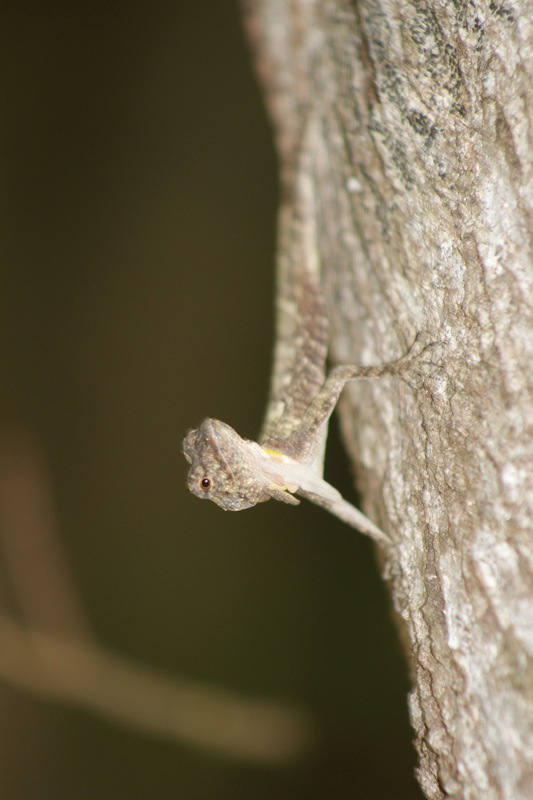 This results in incredibly high levels of endemism, that is, species that occur nowhere else in the world. The most well-known example of this is Darwin’s finches. Dr Frank Van Veen of the Centre for Ecology and Conservation (CEC) investigates how the components of ecological systems like these interact. Many island regions are found within biodiversity hotspots, meaning they have at least 1,500 vascular plants as endemics and must have 30 per cent or less of its original vegetation, resulting in them being both irreplaceable and threatened. In several cases, this is due to the fact that these islands are situated within developing nations, for example, the scores of islands found in the Gulf of Thailand. These islands have been home to small communities for some time, with both the terrestrial and aquatic coastal habitats providing them with food and income, largely through fishing. In addition, habitats, such as coral reefs, which support the highest level of marine biodiversity, act as protection against storms. Mangroves, slat marshes, and seagrass beds are key for storing blue carbon, meaning they absorb large quantities of carbon dioxide from the atmosphere and store it, decreasing the effects of climate change. However, many islands are suffering overexploitation, illegal logging of forests, overfishing and trawling of seagrass beds and coral reefs, and overdevelopment as a result of the booming tourism industry. All of this is motivated by the short-term gain, which is understandable in developing nations, however, in many cases it is a result of large foreign corporations coming in to exploit resources, meaning none of the resulting profit goes to the local population. Overfishing is a key focus of the work of Dr Amber Teacher, from the Environment and Sustainability Institute (ESI). Camouflaged wildlife found on the student expedition. Regardless of this, the aforementioned destruction is completely unsustainable and will result in the loss of key habitats and irreplaceable species. In turn, this will lead to a great loss of ecosystem services, such as prevention of landslides by forests, storage of carbon dioxide, protection from extreme weather. 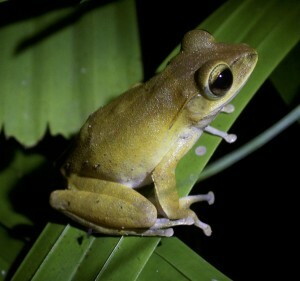 Species that have important ecological roles, such as pest control, will be lost, changing the balance of the island ecosystem. Ultimately, this loss of habitat will result in not only the loss of coastal habitats, coral reefs, and the species that reside within, but also local livelihoods and the tourism industry with the destruction of this ‘paradise’. It is clear that action is required to protect these ecosystems and manage them in a sustainable manner. The Convention on Biological Diversity has set targets to conserve at least 10 per cent of ecological island regions through effectively managed protected area networks. Such work can only be effective if the countries involved take active responsibility for their conservation, while some appear to be moving in this direction, it will be interesting to see how much action is taken before and after irreversible damage is done to these regions. This entry was posted in research on 21st May, 2014 by sj294. Peter Vukusic is a Professor of Biophotonics at the University of Exeter, and helps coordinate science and outreach universities for the College of Engineering, Mathematics and Physical Sciences. He discusses how he helps get children involved in science and why it’s important for us all. Take a minute to think back to your childhood, and some of the moments that stand out in your memory. Peppered amongst the landmark events of birthdays, Christmas and school days, do you recall gazing into a clear night sky and seeing millions of dazzling stars, watching a classic steam locomotive journeying along Brunel’s South Devon railway lines, or searching for the thousands of tiny life forms that make their home in the shrubs and trees of your back garden or nearby countryside? As children, we are blessed with an instinctive curiosity towards the world around us, and we are encouraged to explore our surroundings and discover the rich diversity that both our natural and manmade environments provide. Yet somewhere, along the journey into adulthood, many of us lose our fascination with these still mesmerising aspects of our neighbourhoods and surroundings. You may be asking why I have taken you on this short trip down memory lane. What you have perhaps unwittingly carried out is essentially a potted history of your love affair with science. Think back again to those memories and think about how many relate to science in some way or another – that steam railway was a marvel of contemporary engineering, trying to calculate how many stars illuminate the skies above us is a fundamental questions for astrophysicists, while even board games such as Top Trumps rely on a embracing statistical analysis. In short, the influence of science on our everyday lives is evident pretty much wherever you look. We are fortunate to live in a part of the UK blessed with not only a rich biodiversity, but also a varied landscape ranging from the rugged moorland landscapes to the majestic Jurassic coastline. Meanwhile, Britain’s position as a cradle of invention has mean that we take so many incredible innovations and developments, from the railways to television and radio, and even the internet, almost for granted. Yet if we are to continue to lead the way in innovation and new technology, there needs to be a sea change in our attitudes towards science. The next technological breakthrough won’t be possible without the passion, perseverance and skills of the scientists, mathematicians and engineers of tomorrow. Put simply, it is time to kick-start a quiet revolution to place science at the heart of the next generation. Friday 14 March marked the start of the National Science and Engineering Week, which aims to give children the confidence to question the environment, develop basic scientific theories, increase their observational skills and, perhaps most importantly, have fun while they do so. A huge number of fascinating events and opportunites have been going on to support this. If we can enhance the skills and attitudes towards science in our children now, it is far more likely to stay with them for the rest of their lives. Here at the University of Exeter, we are already passionate about sharing our knowledge and enthusiasm for science with the local community. Throughout the course of the year our staff run a series of outreach events designed to encourage children of all ages to think about what science means to them, and what opportunities it can provide as they start their journeys through adulthood. For example, the University of Exeter Medical School hosts the exciting “Men in White”, event, which allows Year 9 students from schools across the region to experience what working in a research laboratory is really like. Meanwhile, colleagues from our Penryn Campus in Cornwall run the hugely successful Science in the Square event, as part of Falmouth Week, where families can come and learn more about insects, space, ocean life and much, much more. We believe events such as these are the perfect way in which we can give something back to our local community, but just as importantly by allowing children to become scientists for the day, we will sow the seeds to produce the next generation of scientists. In recent decades the lure of science has perhaps been lost to many. The government has recognised the importance of attracting students into science, and last year announced that science and engineering teaching at UK universities will receive a £400 million boost. It is a welcome decision, but is not a total solution to what has become a longstanding problem. Instead, it is up to all of us to make a difference. If we can rediscover our passion for trying to understand the world around us, to marvel once again at the exceptional feats of engineering and technology that we see and use daily, to nurture our natural desire to observe, question and learn, then we can encourage those around us too – and who knows, perhaps discover the next Brunel, Tim Berners-Lee or Professor Stephen Hawking right here on our doorstep. This entry was posted in community on 18th Mar, 2014 by sj294.